Sup, Been awhile since i've made a post here, lot of new names flying around. quick question for y'all, on another local forum i go to been talking to a guy about his old Sato rearsets for my 929, been doing some research but i just don't know what the differance is between Sato's and stock rearsets. He said i can go GP style which i prob won't, I do like the look. 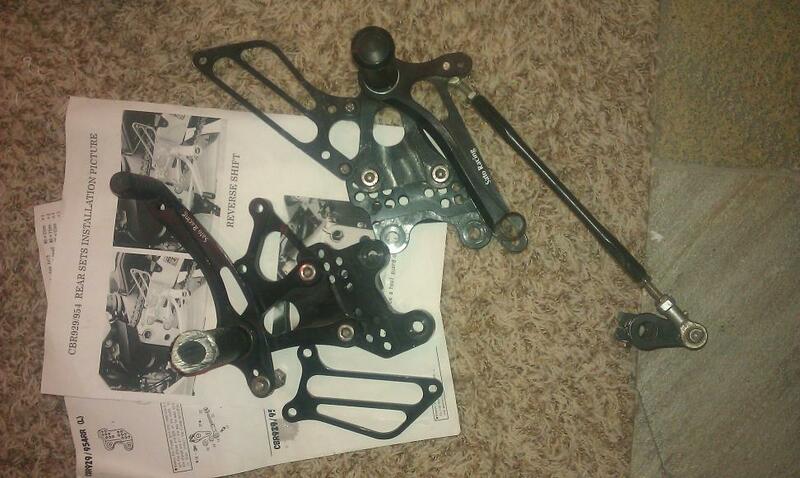 I don't race so it won't matter a whole lot to me, I have stock rearsets with after market pegs which works fine. He wanted 250 for them, he did crash in them and right peg did get grounded down a bit, he has new pegs he will give me with them. I mean is it worth getting for just a every day ride? 250 can get me other things, just seein what y'all think.... Comfort wise any differance? i know weight but a couple of lbs, won't affect a beast like the 929, especially with my tubby but on the bike. "Worth getting for everyday ride?" No, not really IMO. Although, that being said, if you're a dedicated twisty rider, it will give you better positioning in the turns. The adjustability of the Sato's is very nice. They are great on RC51's, I know that much! ;-) FWIW, $250 is a nice price, especially if new pegs are included. I'd prob jump on that. it'll give you adjustability -- with the oem, you're stuck in the only riding position they give you. half an inch of foot position makes a bigger difference than you think it will. Thanks for the help, I am picking it up tomorrow hopefully. I talked him down to 200, so i don't feel so bad about it. especially since yall say it's so great, hopefully i'll get to use it before the cold front comes in; Minnesota so it could be any day without warning. $200 is excellent. If condition is as described, that's a nice deal. Enjoy.